Styled with contemporary flair, this chic 9ct white gold crossover ring is set with a row of sparkling created sapphires and glittering cubic zirconia stones. Perfect for adding a splash of colour to your look. 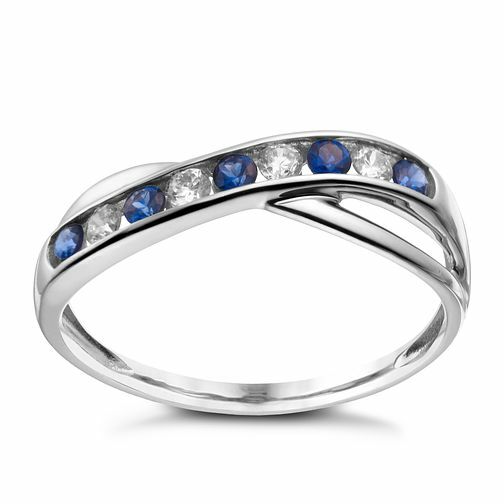 9ct white gold created sapphire & cubic zirconia ring is rated 5.0 out of 5 by 1. Rated 5 out of 5 by Anonymous from Beautiful I bought this ring because I loved the crossover design and the Sapphires make it look more of an everyday ring rather than an engagement ring which I wanted to avoid. When it arrived (on time) it was presented really well. The ring was a lot smaller than I imagined but its what I prefer anyway! A really well designed simple piece but has beautiful finish. I am so happy about this purchase and felt I paid the right price for this ring.